I haven’t had a whole lot going on recently or I guess anything that has inspired me to write an entire blog post about it, but I don’t like my little blog to be neglected for too long. So here a few simple pleasures from my life recently. 1. We have now reached the point of the year that there is still the faintest sliver of light left in the sky when I leave the gym after work. It’s not truly light yet, it gives me hope. Daylight savings time starts in a few weeks. I know a lot of people including my husband hate it, but I say bring it. 2. The beautiful weather from this past weekend of course must be acknowledged. It’s been such a miserable winter that the springlike weather over the weekend was a wonderful reprieve. Not to mention the fact that it helped melt all but the biggest snow piles leftover from the snowstorm the week before. 3. Despite the fact that it was snowing most of the day it somehow really didn’t stick. At this point if it has to snow that is the kind of snow I can get behind. 4. We wound up ordering Chinese food for dinner tonight. It’s been a long time since I’ve had General Tso’s chicken. Not that any Chinese food is really healthy, but in my mind General Tso’s has to be one of the least healthy dishes for you so don’t get it very often anymore. I decided to splurge tonight. I’m sure the one tiny piece of broccoli that I hate totally balanced out all that fried chicken covered in sugary sauce. 5. I didn’t start watching it in the fall when it premiered so it didn’t make my fall TV diary, but I’m really enjoying The Fosters on ABC Family a lot. Some of the things I heard about it after it started made me think it was a show I would enjoy. The first half of the season was actually posted on Netflix prior to the second half of the season premiering, so I caught up with it over my Christmas break. I did in fact enjoy it and have been watching it when it’s on ever since then. Take note other television outlets. This is the way to do it. See how I started watching episodes of show when they air like you want me to because ABC Family let me catch up. Amazing that. 6. Friends that take care of each other. One of my friends is apparently down and out with food poisoning today, so all day long my email inbox was getting filled with amusing videos a group of people were sending around to cheer him up while he was feeling ill.
Last night my husband and I drove down to College Park to see the Wake Forest/Maryland basketball game. That is not what is making me happy because that was a travesty of a basketball game. Both teams played horribly, but of course Wake played worse and lost by 11 points. It was ugly. Wake needs to work on their free throws, passing, shot clock management, and you know all other things related to basketball. I really hope they will finally fire Jeff Bzdelik after this season, but I’ve kind of given up hope on that one. Seems like Wake’s Athletic Director is digging in his heels on this one, and doesn’t want to admit he made a huge mistake. Anyway, on the way home last night I heard “I Knew You Were Waiting (For Me)” by Aretha Franklin and George Michael on the radio. I had kind of forgotten about the song until I heard it last night, but it made me really happy. I just kind of like the song in general, but also everything about it is so gloriously 80s that it makes it even better. I watched the video in preparing to write this blog post and that made it even better. Apparently the song was a much bigger hit than I remember winning a Grammy award and reaching the top of the charts both in the US and the UK. It’s a very joyous song and I hope it puts a smile on your face like it did mine. I can’t remember the last time someone invited me to brunch at their house and yet today I was invited to not one, but two brunches at friends’ houses. Since I have not yet figured out how to clone myself so I can be in two places at once I could only go to one. In order to not have to try and play favorites or decide which one sounded more fun or something like that I just went to the one I was invited to first and had already said yes to attending, which was my friend Alison’s Dames and Games brunch and had to say no to my friend Lindsey’s Galentine’s Day Brunch. Although some of my chairs went to that brunch in my place. I hope they had fun. A Twitter pal posted a link to this Baked Spiced Chai French Toast recipe awhile back and I had been waiting for an opportunity to make it. This brunch seemed like the perfect time. For reasons like I am a moron and don’t know how to measure loaf pans I screwed up the recipe a little bit and then tried to fix it so it wasn’t baked exactly as written. It was still tasty, but I look forward to trying it again made properly to see if it’s even better. I thought it turned out a little mushier than it should have been. There was lots of other delicious food including this caramelized onion quiche that Alison made. I don’t like eggs that much, so I’m normally not a huge quiche fan. This however was delicious. I’m linking it to here so should I ever decide to make it for myself I’ll have easy access to the recipe. As one might guess from the title of the brunch we also played games. We started off with some game whose name I don’t exactly remember but had something to do with guessing if people were werewolves or villagers. It was some game that Alison backed on Kickstarter. You have to have a minimum of 7 people to play which seems kind of crazy. That’s how many we had so gave it a try. I don’t know if it would have been more interesting with more people, but I can’t say I thought it was that great. Then we played a game called Killer Bunnies, which was a little complicated to figure out at first, but then was pretty fun. I think the designers really did not think through some things though as there was no way for people to make change for their money or feed their bunnies with only parts of their cabbage or water cards. I won that game, so yay! Most people left after that, but the couple of us that stuck around finished out the day with a few rounds of Zombie dice. Scout has always loved “catching” various tie type items. In the past she would come triumphantly bounding up the basement stairs making this adorable little meow with various types of wire ties that she found. They varied from velcro ones to plastic ones that Paul had either left lying around or cut off of something. Paul bought a package of hair bands so he could use one to attach his Halloween costume to his head. There were four more in the package. Knowing how much she loved the wire ties I figured Scout would love to play with them so I tossed them out on the floor for her. I was right. She loves them and carries them all over the house. Sadly she has given up her adorable triumphant meowing for a sort of yowling at them, which is not so adorable. It’s funny because she’s usually a very silent cat. She has very strong feelings about these hair bands though apparently. *Note: The talking you can hear in the first 30 seconds or so of the video is an Extra Hot Great mini-podcast, which I was listening to before it dawned on me I should probably shut it off until I finished recording the video. If you haven’t watched both Friday Night Lights and Parenthood this video will mean nothing to you, but for those of you who have you will love it. Since all of their regular programming is off the air for a few weeks due to the Olympics they are making some webisodes for four of their current shows to keep people interested in them. One of the shows is Parenthood. When they announced earlier in the week that the Parenthood episodes would be a Friday Night Lights crossover featuring the band Crucifictorious recording a song at the Luncheonette my little corner of the internet went crazy. In the wake of that I had a lot of fun with my friend Jenny coming up with other crossover scenarios. In order to do this and really to watch these webisodes you have to not think to hard about continuity issues given that Jason Katims has used a lot of the same actors in both series, which would ruin many of these crossovers not to mention the fact that the same actor who plays Billy Riggins on FNL and in the webisodes played an entirely different character on Parenthood already. Don’t get too caught up in that stuff though and just have fun with it. As for future crossovers I suggested Camille Braverman and Matt Saracen could take an art class together. I also thought Drew and Vince could be college roommates at some point. Lyla could totally have just grown up to be the character the actress played on Parenthood anyway. Tyra and Amber would make excellent friends I think. Jenny suggested that Julie Taylor and Jasmine Braverman could go to a stay at home mom’s group together and Jasmine could make Julie less surly. Even before this idea came into fruition I always thought that Matt Lauria essentially played the same character on both shows and that Ryan was really grown up Luke. I guess it works then that somehow Amber would have met Becky through Luke/Ryan and thus the connection that is mentioned in the beginning of the webisodes. I thought the idea was to roll these webisodes out over the next two weeks, but after releasing the first one on YouTube yesterday morning by the end of the day NBC had thrown the whole thing up on their website. I’m embedding the YouTube video, but WordPress won’t let me embed the one from NBC so look for the link to the full series below. I am insanely fascinated by this online Wind Map of the country. I can’t remember when I first became aware of it. Probably around the time of Hurricane Sandy because that is the first time I can remember looking at it and watching how such a powerful storm just seemed to draw all the wind from the entire country into it. It’s not something I look at every day or anything, but definitely when there’s any big weather systems going on anywhere I like to pull it up and see what’s going on. It’s really cool to watch major storm systems move and to see the vortex where all the wind is spinning around when something like that happens. It’s not quite as interesting on days when nothing major is going on. Then it looks kind of haphazard across the country. Obviously today with this nor’easter going up the coast it’s a good day to look at it. It’s interesting as well that it was done as a sort of art project. It’s not any kind of official weather site. Someone is just using data to create a graphical representation of the wind. I kind of like that the idea behind is something more than here’s the weather. Check it out if you haven’t and take another peek even if you have. 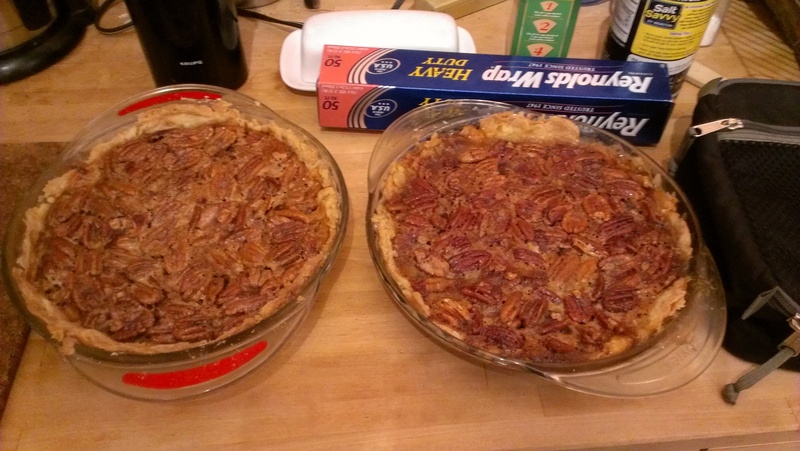 I signed up to bring a dessert to Wednesday night dinner tonight, and decided I wanted to bake pecan pies. My friend Jamie sells pecans as some sort of fundraiser for whatever one does with one’s sorority as an alumni. I had the bag I bought from her this year sitting in my baking cupboard and decided I would use it to bake some pies. In the past I have had awful luck trying to bake pies with a butter crust. I can never get the dough to cohere properly and wind up overworking it. The last butter crust I tried was so bad it was really inedible. I have never had these problems with a shortening crust, so I usually stick to that. I thought I had shortening on hand for last night, but turns out the can I had was many years out of date so I was afraid to use it. I had a tiny bit left from an opened can that wasn’t enough to make 2 pie crusts, but was enough to use this recipe that called for both shortening and butter. I thought maybe having a recipe that used a little shortening would help out. I’m not so sure it did. I was wary of the way the crusts were when I put them in the pie plates. I haven’t tried the pies yet, so hopefully things turned out better than I think they did. People can just eat the topping off the crust if it’s too horrible I guess. I used the basic Karo corn syrup recipe for the actual pie filling with half dark corn syrup and half light. They look and smell delicious so hopefully they will taste that way as well. And of course I couldn’t leave this post without somehow tying these pies into some pop culture references. It is of course required to pronounce pecan pie like they do in this scene of When Harry Met Sally. And of course I can’t bake a pie without singing Patty Griffin’s “Making Pies” in my head while I do it.